125 руб. 541 шт. 3-4 недели 1 шт. 1 шт. от 25 шт. — 90.80 руб. 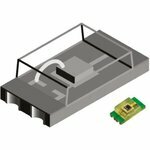 The TEMT6000X01 is an Ambient Light Sensor features floor life of 168h, MSL 3, according to J-STD-020. It is a silicon NPN epitaxial planar phototransistor. It is sensitive to visible light much like the human eye and has peak sensitivity at 570nm.